After Boua closed we visited Lhy Thai several times only to be disappointed by bland fare and small portions. One time, I went on my own for a plate of Pad See Ew. It was the absolute worst plate of Thai food imaginable. Undercooked broccoli, overcooked beef, tough noodles and burnt garlic, to boot. The Tom Yum Gai was as watery as you could make it. I vowed never to return. 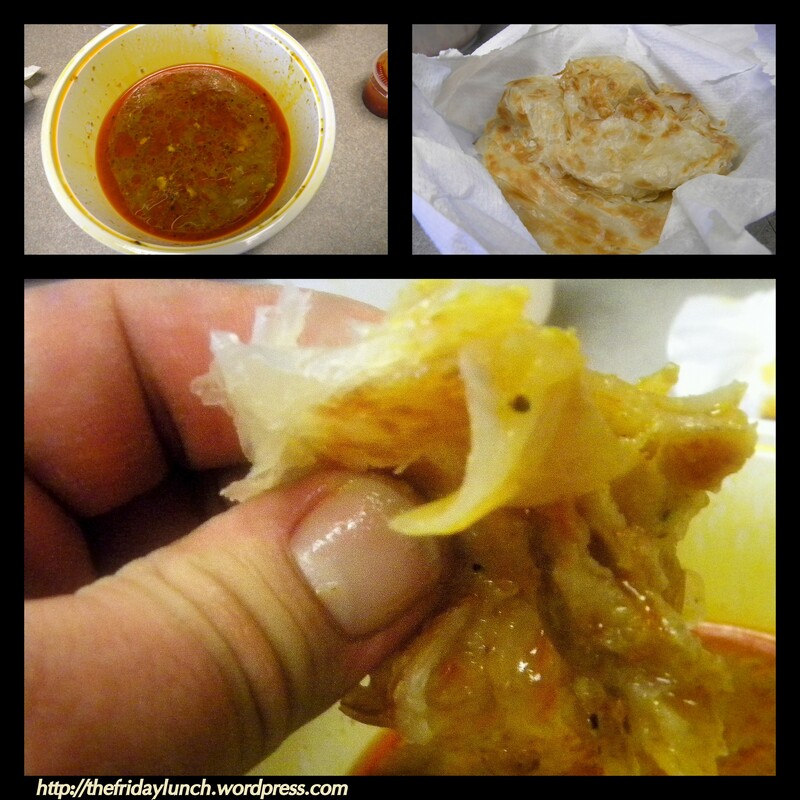 Then, last week, Benzie and a buddy of his wanted to check out some Asian fare in Burnaby. They wanted to try Lhy Thai. I caved and wound up having one of the best meals of my life. 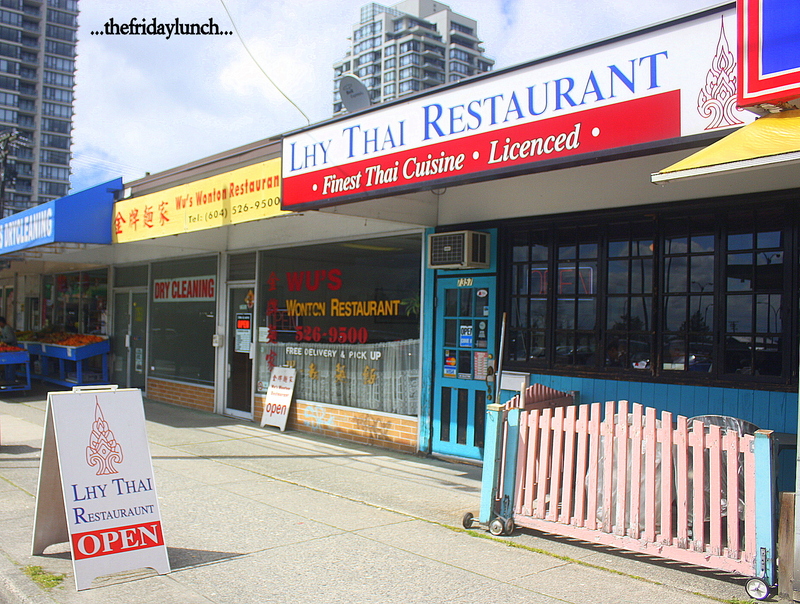 Lhy Thai is located on Edmonds just east of Kingsway. Not exactly a culinary mecca but there’s a few decent spots in the area. Even on a late Wednesday evening, right before closing, Lhy Thai was around half full. Most lunchtimes the place is packed…most tables reserved. Even the local MLA was seen waiting for a seat! On our first visit, last Wednesday, I showed up with a dead battery in my camera. I had to resort to my trusty iPhone for a few unspectacular shots. 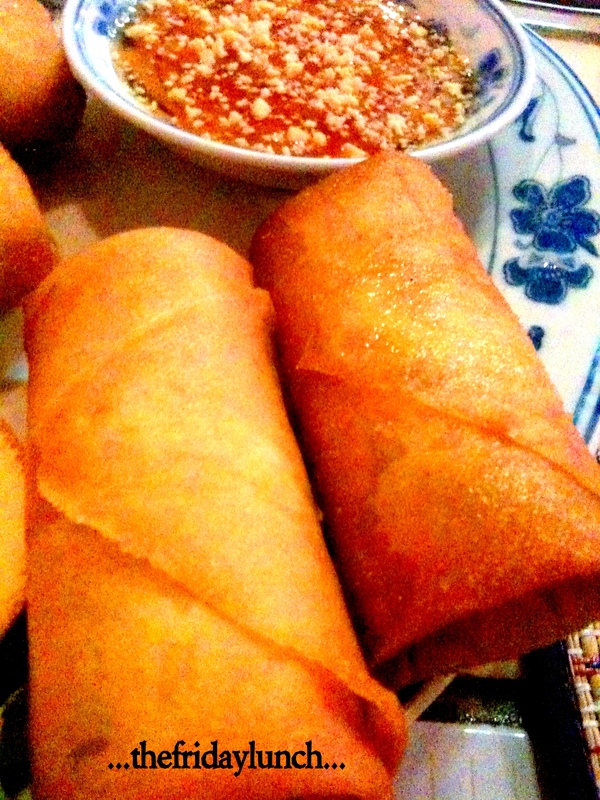 Some really good Spring Rolls here. They’re jam-packed with carrot, black mushrooms, cabbage and vermicelli. The sprinkling of crushed nuts on the sweet chili sauce was a nice little addition. The Som Tam (Papaya Salad) was, to put it simply, outstanding. 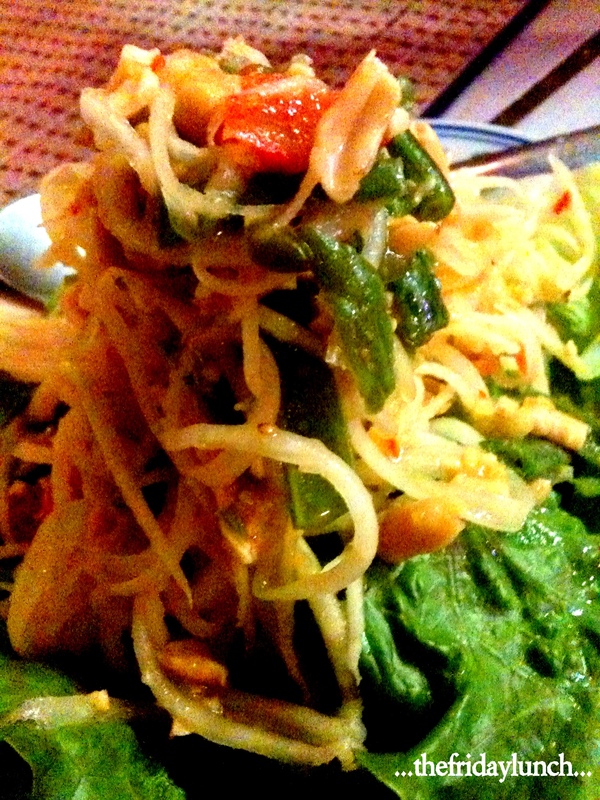 A cool, crunchy combination of shredded green papaya, chili, sugar, lime, fish sauce, tomato, peanuts and shrimp paste. Huge, bright flavors…extremely refreshing at the outset. As one gets to the middle, things start to intensify. Near the bottom, especially beneath the lettuce leaf, you know exactly why it’s labelled “Thai-style” on the menu. By the way, if you ever want things supremely spicy in a Thai resto, just mention “Thai-style” while ordering. That’s the real deal. An absolutely incredible feast all around. So good, in fact, that I got together another gang two days later to try and re-create it for a Friday lunch. “Bo was a Grade 12 student in Mawlamyine during the summer of 1988 when protests swept through the country. Thousands of citizens joined the uprising, only to be viciously quashed in a bloody military attack. It is believed thousands were killed in that crackdown. Go ahead and read the entire article. It’s a rare glimpse into a beautiful, forgotten corner of the world. Luckily, for us, Bo learned how to put out some damn good food. 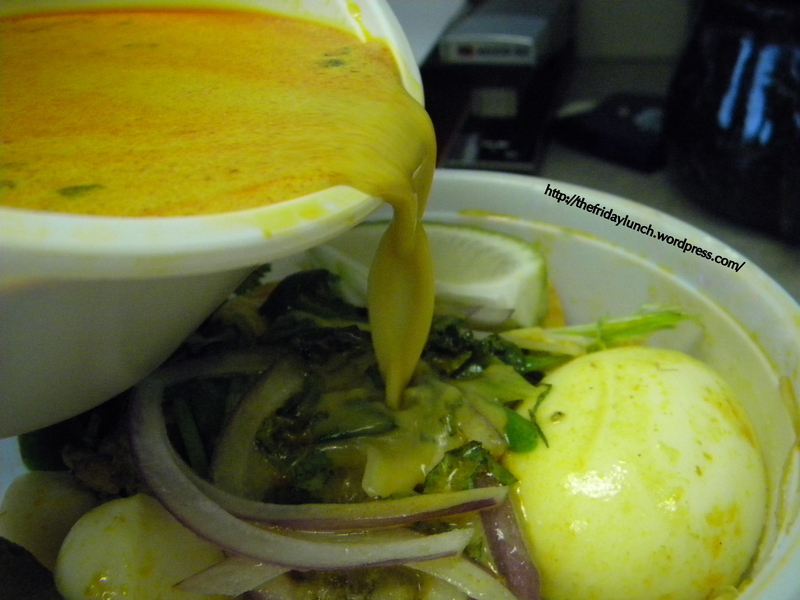 I first experienced his amazing Laksa and Roti Canai a year ago. Since then, he and his wife, Tiffany, have moved from a grocery store on Joyce to a brand new shop on Hastings. This new venue consists of Bo’s kitchen, a bubble tea bar and a compact dining area for sixteen or so. He’s brought the best of his old menu and loaded on a wide variety of ‘Pan-Asian’ cuisine. A couple of years ago, as we were driving around in North Burnaby, I noticed an old diner had been transformed into Tom Yum Thai. Being an aspiring foodie at the time, I naturally stopped and gave it a try. It was underwhelming, to say the least. I can’t even remember what dishes we had. Since then I hadn’t given it a second thought. 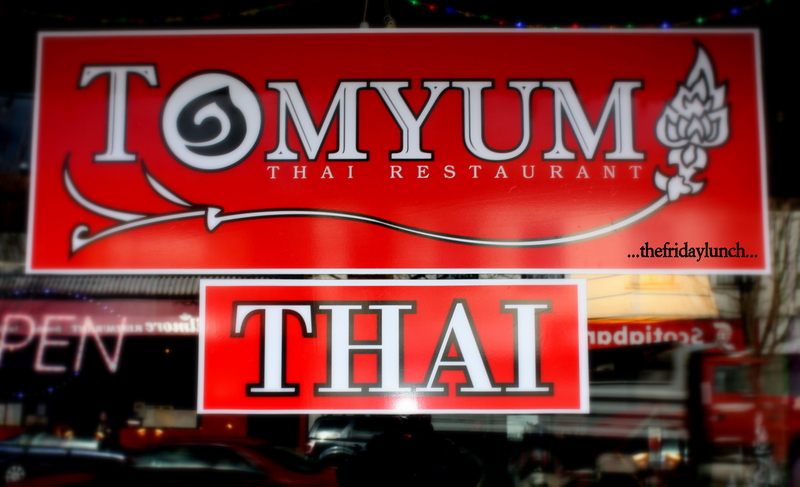 Then I saw that Jessica from Yum-O-Rama had paid them a visit and put up a post. It became apparent that another visit was in order. The day after reading Jessica’s post I went on a solo scouting mission. When I read her post, the first thing I thought about was a possible Friday lunch gathering. No sense dragging the gang out for a mess of mediocre grub. Whenever I visit a Thai restaurant for the first time I order Pad Thai. It seems imperative that any successful, authentic Thai restaurant will produce an above-average version of this plate. 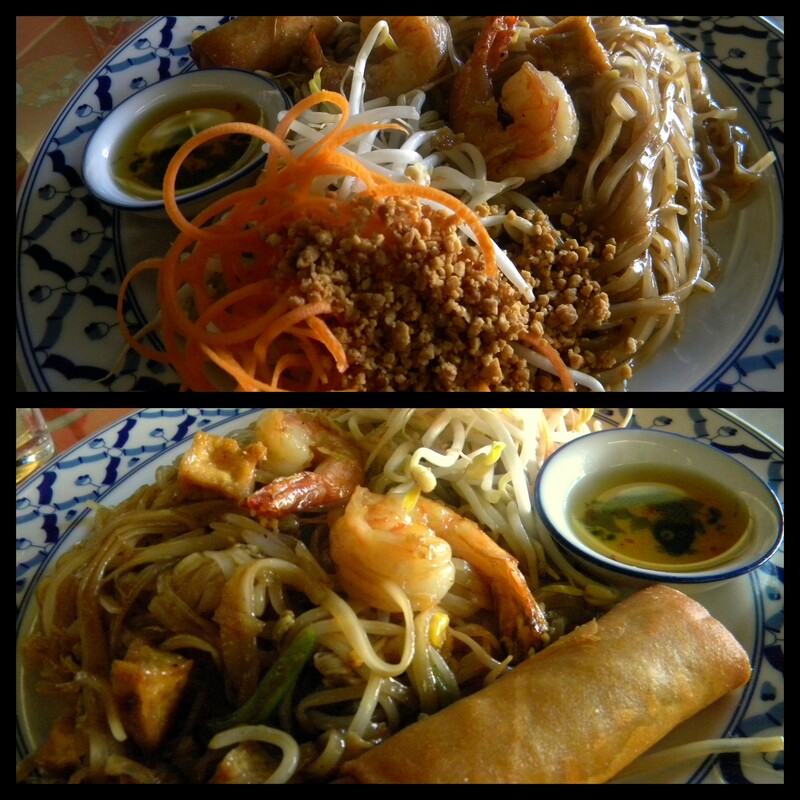 For the longest time I had Thai Cafe ranked as the best Pad Thai in Burnaby. Tom Yum’s Pad Thai is equal, if not better. This is top-notch Pad Thai. Rice noodles, perfectly cooked, lathered in a sweet, spicy and tart tamarind sauce…several tender prawns, tofu and crunchy sprouts…a really good balance of ingredients. The unique part is the ground peanuts and roasted ground chilies on the side. This allows the diner to season everything to their liking. So far, very good. It’s time to call in the troops and have a feast! 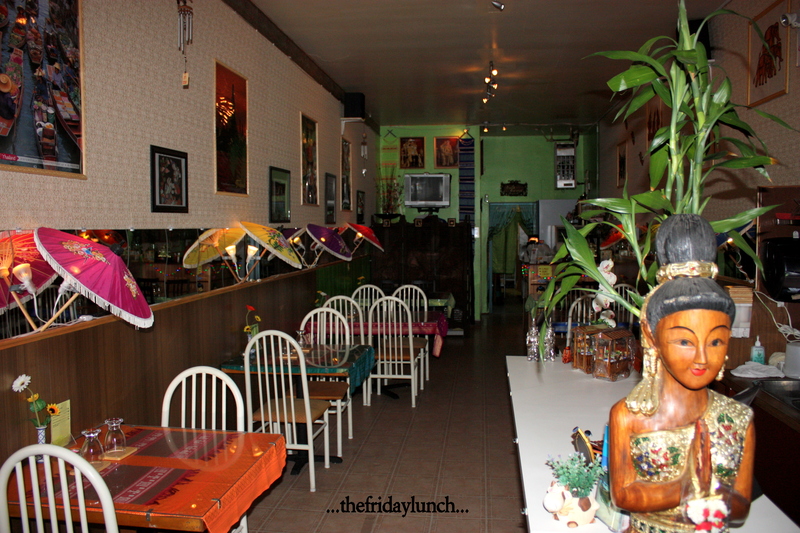 Thai Cafe is another of the Friday Lunch crews’ favorite venues in Burnaby. After the sudden and inexplicable demise of Boua Thai, Thai Cafe quickly filled the void. For several years now it has been a guaranteed great Pad Thai fix. 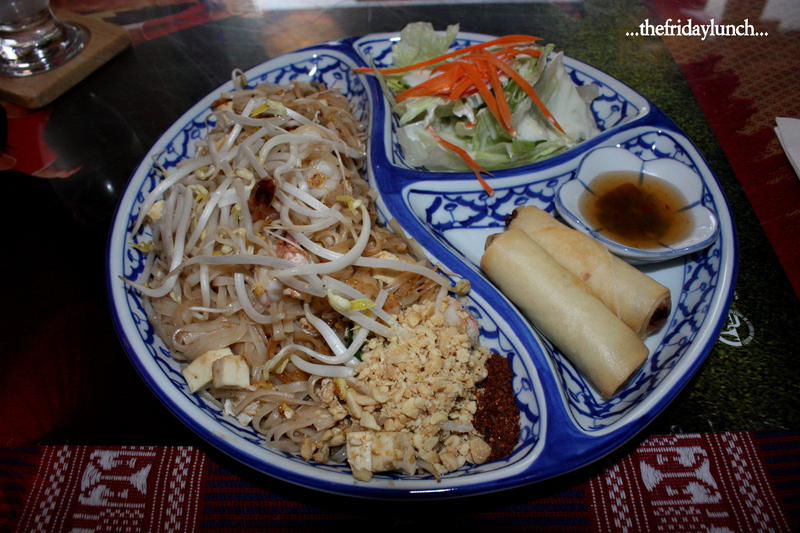 This is exactly how Pad Thai should be. All of the elements are in place. Hot (chili paste), sour (tamarind and lime), salty (fish sauce) and sweet (palm sugar). Rice noodles perfectly cooked amongst crisp bean sprouts and carrot, crunchy peanuts, tender cubes of fried tofu, scallions and prawns. An excellent Pad Thai. The other day I had a hankering for Pad Thai. Having visited all the Thai restaurants in the Burnaby/New West area, I decided to venture across the Fraser. After reading Sherman’s take on Hakka Masti’s version of Pad Thai, I had to try it for myself. 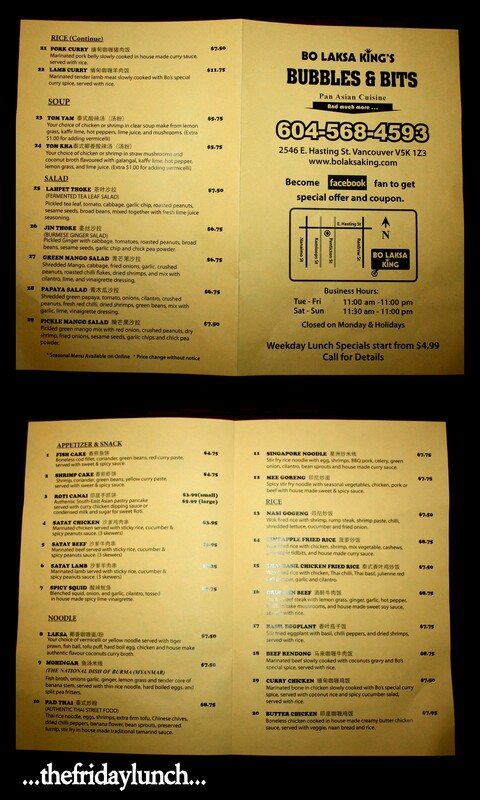 Hakka Masti is a Chinese-Indian fusion restaurant with a variety of Thai cuisine added to the mix. It all makes for quite an extensive menu and some interesting flavor combinations. 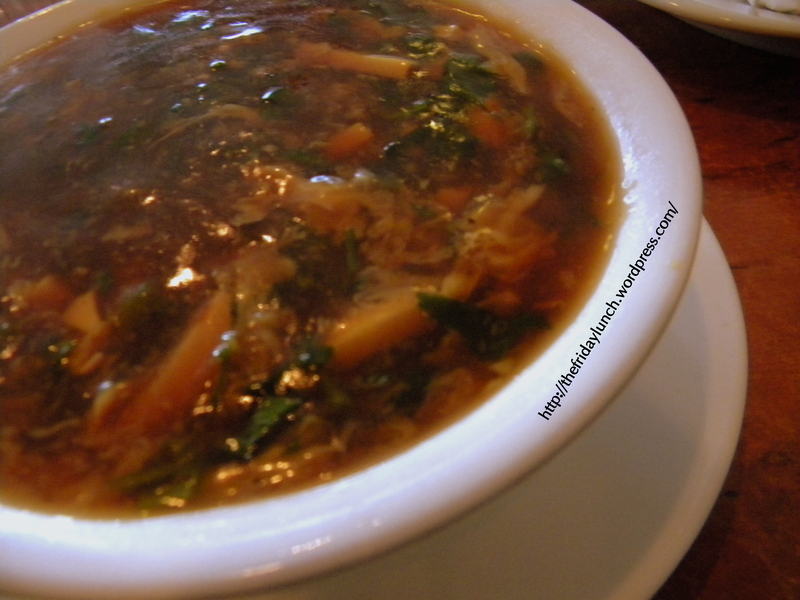 First off, the ever-popular Hot & Sour Soup. Normally there would be slivered carrot and bamboo shoot, maybe wood-ear funghi. Hakka’s version is quite different. This is loaded with cilantro and what appear to be canned, sliced button mushrooms. Quite unexpected but damn tasty. Oh, and BTW, it is very, very spicy! That ain’t just some wimpy white boy talking. As I was eating my soup, an Indian gentleman got up from his table to tell the server that there was too much spice in his family’s meal! Now that’s some heat! 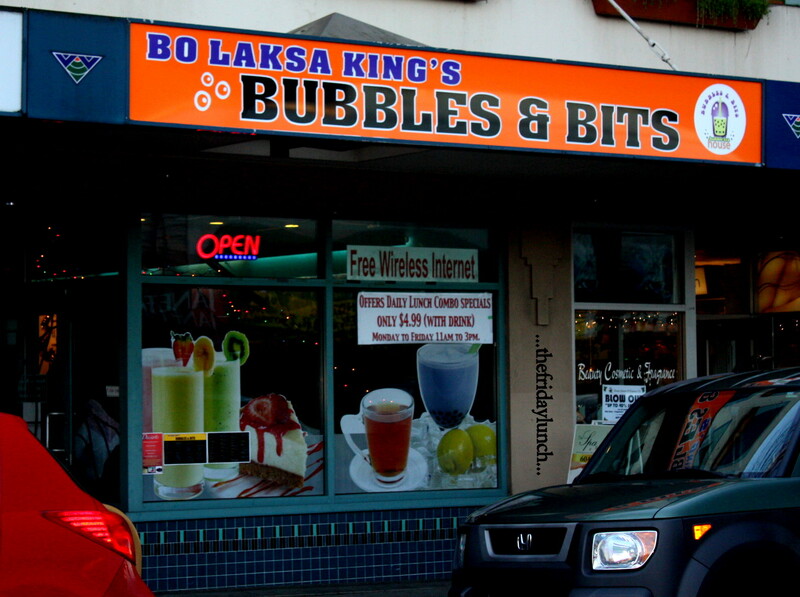 Once upon a time, there was a restaurant in Burnaby called Boua Thai. Boua Thai was, looking back, a mythical place. Those who frequented it regularly, still speak of it as the last, great Thai restaurant in this area. It was where I discovered Pad Thai. Their version was perfectly made…always moist noodles bathed in a chile-laden tamarind sauce amidst a bevy of prawns, shrimp and chunks of golden tofu. Their Pad Gai Gra Prao (Thai Basil Chicken) was always served as it should…loaded with Thai Basil. The term ‘I got sumoed’ was coined at Boua because the size of the portions made you feel like a sumo wrestler. It was common for us to visit two or three times a week and then again on the weekend. We were there on the day they were forced to close their doors. What happened that day still remains a mystery. Since then, I have been on the hunt for a local Thai restaurant of that quality. Thai Cafe and Lhy Thai have come close. Another one on the radar is Pattaya. 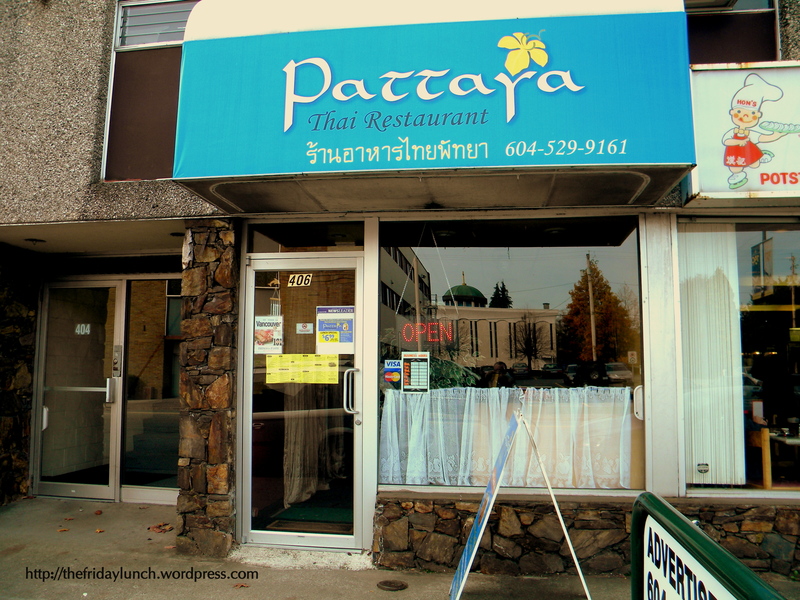 Pattaya Thai Restaurant is located on 6th Street in New Westminster beside Hon’s Wonton House. It’s a very small room (six booths) run by a Thai family. They offer a common lunch special menu with all items at $6.99.